Everyone knows that Independence Day is celebrated in July,<span style="> but a lot of us don't know that July is also National Picnic Month. Who doesn’t like sunshine, delicious foods, and nature walks to beautiful locales? Picnics are a great way to see the city you live in, and we’ve got your guide to creating legendary summer picnics that you’ll remember for a lifetime. Follow along to make sure all the points are in order. Hot potato or duck, duck, goose for the younger crowd. Stick with foods that can take the heat. You should definitely bring a cooler, but you’ll want plenty of room for drinks. Foods that don’t need refrigeration mean no risk of spoilage while you take your time in the sun. Don’t forget ice-cold drinks, napkins, plates, and utensils! If cooking is not your forte you can never go wrong with ordering an on the go meal from one of the great downtown eateries like Plank on Main, and you can’t pass on dessert, visit Bluegrass & Buttercream for a smorgasbord of sweets. Many of the retailers in downtown Danville have everything you need to make your picnic special including baskets, coolers, and picnics in a backpack. And who knows, they may even have their own favorite picnic locations. Now that you have everything planned out, it’s time to get out there and picnic. Go enjoy the month. Picnic ahoy! 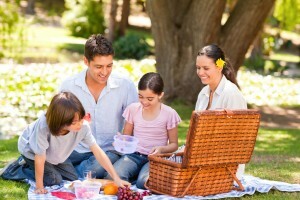 Have more great picnic ideas? Let us know about them on Facebook!